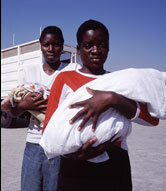 Zimbabwean women and infants at the Centre for Illegal Immigration in Botswana. 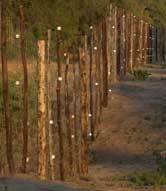 How does prosperous Botswana secure its borders and accommodate the influx of tens of thousands fleeing hunger, unemployment, and political repression in neighboring Zimbabwe? Africa has long been saddled with poor, even malevolent, leadership: predatory kleptocrats, military-installed autocrats, economic illiterates, and puffed-up posturers. By far the most egregious examples come from Nigeria, the Democratic Republic of the Congo, and Zimbabwe — countries that have been run into the ground despite their abundant natural resources. But these cases are by no means unrepresentative: by some measures, 90 percent of sub-Saharan African nations have experienced despotic rule in the last three decades. Such leaders use power as an end in itself, rather than for the public good; they are indifferent to the progress of their citizens (although anxious to receive their adulation); they are unswayed by reason and employ poisonous social or racial ideologies; and they are hypocrites, always shifting blame for their countries’ distress. Under the stewardship of these leaders, infrastructure in many African countries has fallen into disrepair, currencies have depreciated, and real prices have inflated dramatically, while job availability, health care, education standards, and life expectancy have declined. Ordinary life has become beleaguered: general security has deteriorated, crime and corruption have increased, much-needed public funds have flowed into hidden bank accounts, and officially sanctioned ethnic discrimination — sometimes resulting in civil war — has become prevalent. This depressing picture is brought into even sharper relief by the few but striking examples of effective African leadership in recent decades. These leaders stand out because of their strength of character, their adherence to the principles of participatory democracy, and their ability to overcome deep-rooted challenges. The government of Mozambique, for example, brought about economic growth rates of more than 10 percent between 1996 and 2003, following the economic catastrophe wrought by that country’s civil war (which ended in 1992). And in Kenya, President Mwai Kibaki has strengthened civil society, invested in education, and removed barriers to economic entrepreneurship instated during the repressive rule of Daniel arap Moi. The best example of good leadership in Africa is Botswana. Long before diamonds were discovered there, this former desert protectorate, which was neglected by the British under colonialism, demonstrated a knack for participatory democracy, integrity, tolerance, entrepreneurship, and the rule of law. The country has remained democratic in spirit as well as form continuously since its independence in 1966 — an unmatched record in Africa. It has also defended human rights, encouraged civil liberties, and actively promoted its citizens’ social and economic development. 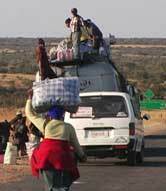 A group of Zimbabweans hit the road with their belongings in tow. What has enabled Botswana to succeed where so many other African nations have failed? Some observers point to the relative linguistic homogeneity of the country. But Somalia, which remains unstable despite a similar uniformity, shows that this factor is far from sufficient. Others point to the century-old teachings of the congregational London Missionary Society — the peaceful, pragmatic outlook that is inextricably bound up in the country’s political culture. But this explanation also fails to explain why the same positive effects have not been witnessed in other countries with a history of Christian teaching, such as in neighboring Zambia. Nor are Botswana’s plentiful diamond reserves responsible: Angola, Gabon, and Nigeria all have abundant natural resources, but none has seen comparable returns for its people. It is Botswana’s history of visionary leadership, especially in the years following independence, that best explains its success. Sir Seretse Khama, Botswana’s founding president, came from a family of Bamangwato chiefs well regarded for their benevolence and integrity. When Khama founded the Botswana Democratic Party in 1961 and led his country to independence, he was already dedicated to the principles of deliberative democracy and market economy that would allow his young country to flourish. Modest, unostentatious as a leader, and a genuine believer in popular rule, Khama forged a participatory and law-respecting political culture that has endured under his successors, Sir Ketumile Masire and Festus Mogae. Although operating in very different circumstances, Mauritius’ first leader, Sir Seewoosagur Ramgoolam, held to the same leadership codes as Khama. Ramgoolam gave Mauritius a robust democratic beginning, which has been sustained by a series of wise successors from different backgrounds and parties. Both Khama and Ramgoolam could have emulated many of their contemporaries by establishing strong, single-man, kleptocratic regimes. But they refused to do so. Effective leadership has proved the decisive factor in South Africa, too: without Nelson Mandela’s inclusive and visionary leadership, his adherence to the rule of law, his insistence on broadening the delivery of essential services, and his emphasis on moving from a command economy toward a market-driven one, South Africa would probably have emerged from apartheid as a far more fractured and autocratic state than it did. Too few African leaders have followed the examples of Mandela, Khama, and Ramgoolam. Ghana, Lesotho, Mali, and Senegal are all showing promise. But in many other African countries, leaders have begun their presidential careers as democrats only to end up, a term or two later, as corrupt autocrats: Bakili Muluzi of Malawi, Moi of Kenya, and, most dramatically of all, Robert Mugabe of Zimbabwe. Other leaders, such as Sam Nujoma of Namibia and Yoweri Museveni of Uganda, may be heading in the same direction. To build on the positive leadership examples, a select group of prominent past and present African leaders who met over the last year decided to confront the continent’s pathology of poor leadership with deeds as well as words. At the conclusion of a series of private meetings (the final one of which was held in Mombasa, Kenya), they established the African Leadership Council, promulgated a Code of African Leadership with 23 commandments, issued a Mombasa Declaration promoting better leadership, and proposed a series of courses to train their political successors in the art of good government. Members of the council believe that absolute standards of leadership are both appropriate and attainable. Good leaders deliver security of the state and of the person, the rule of law, good education and health services, and a framework conducive to economic growth. They ensure effective arteries of commerce and enshrine personal and human freedoms. They empower civil society and protect the environmental commons. Crucially, good leaders also provide their citizens with a sense of belonging to a national enterprise. Conscious that Africa’s poor are getting poorer and that good governance is essential for successful economic development, the council sees itself at the vanguard of fundamental reform in the continent. Its approach certainly goes far beyond the New Partnership for Africa’s Development (NEPAD) and proposals for the African Union. The Code of African Leadership, for example, says in its first commandment that leaders should “offer a coherent vision of individual growth and national advancement with justice and dignity for all,” implying that most leaders today do not. Other commandments demand that African leaders encourage “broad participation,” adhere to the letter and spirit of their national constitutions (especially term limits), encourage dissent and disagreement, respect human rights and civil liberties, strengthen the rule of law, promote policies that eradicate poverty and improve the well-being of their citizens, ensure a strong code of ethics, refuse to use their offices for personal gain, oppose corruption, and bolster essential personal freedoms. This uncommonly bold agenda seeks to avoid renewed patrimonial leadership debacles, such as those presided over by Mobutu Sese Seko in Zaire, Moi in Kenya, Idi Amin in Uganda, and Jean-Bedel Bokassa in the Central African Republic. The council is highly conscious, too, of the hijacking of Zimbabwe’s government by Mugabe, which has resulted in starvation and drastically reduced living standards. The council is chaired by former President Sir Ketumile Masire of Botswana and includes former Nigerian head of state General Yakubu Gowon, Vice President Moody Awori of Kenya, former Prime Minister Hage Geingob of Namibia, and a dozen other present and former prime ministers and cabinet ministers from Sierra Leone to Kenya, Malawi, and Uganda. All are regarded throughout Africa as men of unusual personal probity and esteem and as accomplished proponents of good governance. The council intends to recruit additional members from the ranks of Africa’s outstanding democratic leaders, Francophone and Anglophone, female and male. Together they will serve the continent by advising international organizations, individual countries, and donor agencies on how to improve leadership. The group stands ready to assist civil societies in countries undergoing serious leadership crises. It will also urge greedy national leaders to attack corrupt practices and adhere to term limits (the current presidents of Gabon, Malawi, Namibia, Uganda, and Zambia, for example, have all had pangs of desire for illegal third terms). Next year, it expects to begin holding special seminars for cabinet ministers and others. The council’s curriculum emphasizes constitutionalism, the rule of law, ethics, accountability, diversity, good fiscal management, coalition building, and the fundamentals of modern micro- and macroeconomics. Training courses will soon be launched. Whether the efforts of the African Leadership Council will reduce bloodshed, diminish corruption, and encourage more prosperity for citizens across Africa is by no means certain. But as a unique African response to the continent’s immense needs, this innovative endeavor is a promising, dramatic step forward. Robert I. Rotberg is Director of the Program on Intrastate Conflict at Harvard University’s John F. Kennedy School of Government and President of the World Peace Foundation.